Citation Information: J Clin Invest. 2007;117(12):3655-3657. https://doi.org/10.1172/JCI34182. Pathophysiology of TSLP in allergic inﬂammation. Insults from allergens or viruses trigger mucosal epithelial cells or skin cells (keratinocytes, ï¬broblasts, and mast cells) to produce TSLP. TSLP initiates the innate phase of allergic immune responses by activating immature DCs to produce the chemokines IL-8 and eotaxin-2, as well as the Th2-attracting chemokines thymus and activation-regulated chemokine (TARC) and macrophage-derived chemokine (MDC), and by costimulating mast cells to produce IL-5 and IL-13, as well as GM-CSF and IL-6. 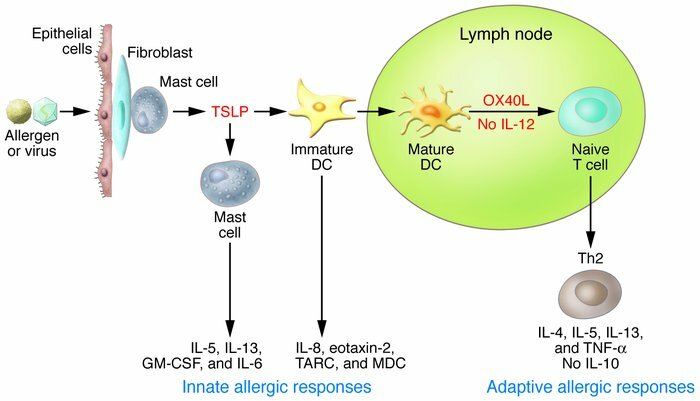 TSLP-activated DCs mature and migrate into the draining lymph nodes to initiate the adaptive phase of allergic immune responses. TSLP-activated DCs express OX40L, which triggers the differentiation of allergen-speciï¬c naive CD4+ T cells into inﬂammatory Th2 cells that produce IL-4, IL-5, IL-13, and TNF-α but not IL-10. Inﬂammatory Th2 cells then migrate back to the site of inﬂammation because of the local production of TARC and MDC. The cytokines produced by the inﬂammatory Th2 cells (IL-4, IL-5, IL-13, and TNF-α) initiate allergic inﬂammation by triggering IgE and mucus production and eosinophilia. Figure modified with permission from J. Allergy Clin. Immunol. (25).